1) Outdoor Use - This rack has a multi-stage rust protection finish that allows this rack to be used outdoors in freshwater areas. When your kayaks are too big and bulky to be stored indoors setup this rack outside to store your kayaks. 2) Freestanding - StoreYourBoard customers always like the convenience of a freestanding rack. With a freestanding rack there is no need to screw or drill into your walls. All you need is a flat level surface to put the rack on and then put your kayaks on the rack. This rack can also act as a multisport rack. It is great for canoes, SUP, and surfboards. So if you are into watersports get one of these racks and get all your gear stored and ready for use. This rack also works well in a retail store as display. The way this freestanding rack is setup also enable you to use the top rack as a place to hold your boat while you do maintenance and repair. It will hold your kayak when you want to get it rigged up for your next trip as well. The arms of this kayak rack are also wrapped in high density foam to protect the hulls of your kayaks from any scrapes or scratches while in the rack. Howdy! I’m Andrew from StoreYourBoard.com here to talk to you today about our Freestanding Kayak Rack. This is a great option. It’s a nice and compact way to store two kayaks in your garage, maybe under your deck, your basement – wherever you want to put your kayaks away. You can see it right here we got two 10-foot recreational kayaks. There is a top level and there is a bottom level. The top-level kayak will lay flat horizontal; the bottom level you can choose to put your kayak on a slight angle. We’ll move the kayaks around to show you more of the rack in a minute, but here it is, fully assembled. There is some slight assembly required with two kayaks. So now we’ll take this top kayak off and you can see this top level. On the front and back, there are bent pieces of metal that cradle your kayak to allow it to lay horizontal. You can choose to lean your kayaks towards that front piece if you want or rest it on that back piece. The space from here to here is about 28 inches to fit a wide variety of kayak width. The space from here to here is about 4 feet, 48 inches, so you really can go to some pretty long kayaks, but however you feel comfortable maybe based on the combination of widths and lengths what you’ll fit on that space. So now we’re going to move this bottom-level kayak to the top, so you can see right now it’s sitting on that front up bent metal piece. You can move it to the back if you choose. You’ll notice on the bottom level, the kayak has to fit in a little bit tighter space. This is about 24 inches. It doesn’t have that back extension piece, but that’s still ample room. You can maximize that room by angling your kayak the way we had it earlier. Just one last thing to point out. This is made of powder-coated steel material. It’s very heavy duty and we recommend it for some outdoor use but more in freshwater environments. We have a couple of other stainless steel heavier duty outdoor saltwater racks. Last thing, these support pieces are padded with some heavy-duty foam, a great way to keep your boat from experiencing any pressure distortions while they’re in the rack. Check it out today on StoreYourBoard.com. I'm wondering if this rack would work ok with a 14ft kayak and a 10.6 ft SUP board? Yes, our indoor-outdoor freestanding kayak rack will hold a kayak up to 20 feet long, so your 14 foot kayak will be fine on it, and the SUP will not be a problem, at 10'6", either. Will this rack accommodate a 30" wide kayak? This freestanding kayak rack should be fine for a 30" wide boat - the arms are a little less than 28" deep, so you may need to tilt it, or have a little overhang, but that should be fine. Can this rack be locked to something...tree, etc? Our freestanding rack could be locked to something like a tree. There also are some kayak locks you could use to lock the kayaks to the rack and/or another object like a tree, such as these Kayak Locks or these Universal Kayak Locks and some more locking options here. Most info. i have received about storage of kayaks indicates they should be stored on side or top down, not on hull. Your video and other pcs. show the kayak being stored on hull. I thought storing on hull may warp kayak. Please advise. 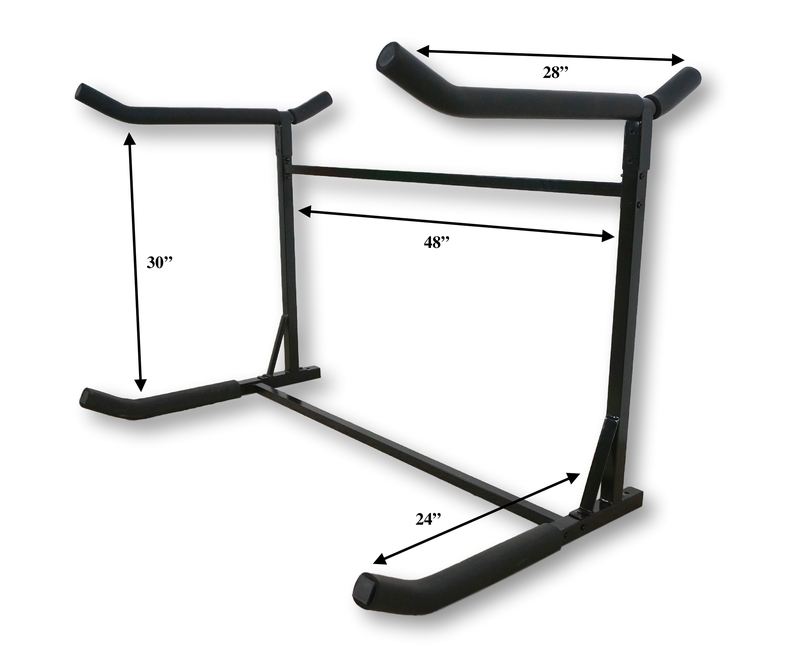 This particular kayak stand has heavy duty foam padding on the support pieces, which helps prevent your boat from experiencing pressure distortions during storage. You can also use the stand with your boats turned upside down on both levels, which you can see in one of the photos. The bottom level also gives you a the opportunity to have the boat more on its side/angled. This stand is a good option for people needing to store a couple of kayaks, and it also functions as a multi-sport stand. We do offer a lot of options for storing kayaks, to meet different needs and budgets. These include racks that hold the boat on its side, or cradles them in a suspension system, if you are particularly concerned about additional protection of your kayak. ou can find a variety of other options in our kayak rack collection; and we are always happy to help you find the right one for your kayaks, if you need further assistance. The instructions indicated that rack is intended for indoor use only, while your website states that it is for outdoor use -- which is want I want, since I will store it outside. Please clarify. We apologize for any confusion from the instructions, which may be misleading, as this kayak rack has been verified with the manufacturer as having a multi-stage rust protection finish applied to it -- so we do use this rack outdoors ourselves, and we can recommend it as being suitable for use outdoors in fresh water areas. hat metal is the rack made of? What kind of rust protection is used? We will be using it within 10' of a brackish canal. Our Freestanding Kayak Rack is made out of steel, but it is not stainless steel. The multi-stage rust prevention process it has been treated with will help prevent its weathering outdoors in freshwater environments, but on a brackish canal where you are in a saltwater area, it would be subjected to rusting and corrosion, and we would not recommend its use. Some stainless steel and marine grade options for your kayaks can be found in our collection of outdoor kayak racks here, which would be better suited to a saltwater area. You indicated that you have a similar 2 kayak storage rake made for salt water. Do you have online information about it? Yes, this two kayak rack in stainless steel is one we would recommend if you are storing your kayaks outside in a salt water/air environment. There are also a couple of other options which are either made from marine grade materials, or are stainless steel, and those are included with our collection of outdoor racks for kayaks. If you aren't certain about whether one of those other outdoor options is right for your environment, let us know, we are happy to help. Can this rack can handle salt water usage? This rack is not meant for use in saltwater environments. Our saltwater safe racks can be found at this link: Saltwater Kayak Racks. This kayak stand weighs a bit under 20 lbs. Can kayaks be stored upside in this rack? Yes, you can store kayaks upside in this rack! You can see an example of this in the listing photos above! What is the height of this if you add the expansion rack? OurIndoor & Outdoor freestanding kayak rackwill be 61" tall when you add the expansion for the 3rd kayak rack. Can this rack be secured to pavement? Are there holes in the base where anchor bolts can be used to secure it to the pavement? This is for a public use area and concerned they could be stolen if not anchored. When you zoom in on the product picture on our site you should see a small hole at the back end of each foot of the rack. These holes could potentially be used to bolt the rack to the ground if you can use a thin enough bolt to go through the pavement as well. If the holes aren't big enough you could also use some shaped brackets from a hardware or building supplies store to fit over the cross bar or lower arms of the rack and secure it to the concrete with those holding it down. Use your own tools, but works perfectly! This was perfect for our two 9.5 fr recreational kayaks! The tools that came with the set for assembly didn’t work great, but if you have your own you’ll be good to go! Space saving and perfect for storage while still looking nice!! Ordered a 3 Kayak storage unit. It came as promised, easy to assemble, and completely satisfied my needs to store my kayaks in my garage, out of the way, and for a reasonable price. Stores my new kayaks and frees up garage space. Easy to assemble, although the wienie tools they provide are kind of worthless. Suggest you use your own. The amazing thing is that all the holes line up for assembly...this is rare on mass produced items. Good product at a decent price. It is everything that I expected. It went together nice, it looks nice and it does what I expected. Easy to assemble, meets my storage needs. Elegantly simple design and engineering. Extremely easy to assemble. Leveling feet makes it adaptable to uneven floor surface if necessary. Handles 2 14' kayaks without difficulty (product info had said top should only be 12', but so far no problem). To be fair I won't really be able to evaluate this rack until next Spring. That said it is light weight and easy to assemble ( If you don't use the tools included). Tip: bungie cords attaching kayaks to rack helps with wind gusts. We recently bought this rack as we were tired of our kayaks just laying all over and looking messy. This keeps them organized and looking neat. In the summer we will put it outside and put the kayaks upside down so they don't collect water when it rains. The rack is sturdy and easy to assemble. Pretty easy to assemble, but I used real tools rather than the toy tools they included with the set (only one sized nut and allen wrench to assemble). Sturdy and easy to lift the kayaks onto. Very lightweight and portable. I plan on keeping them close to driveway in warm weather, them moving the rack into my shed to store overwinter. this store was great. Good info on the web site free shipping , unit came quickly. And.. was very easy to put together and works perfectly. I rate this excellent!! Easy to put together. Hardware was good quality. Loaded it up with one 14' and one 16' polypropylene boats, seems solid under load. Assembly is easy and it's very sturdy. Pleased with sturdiness and quality of materials. Directions easy to follow. Was one nut short prompting a trip to hardware store. Written by: Thomas j W.
Great product, small footprint and is exactly what I was looking for. So glad I found this site. However ... What should have been an easy assembly was frustratingly complicated by faulty assembly instructions. Part piece instructions were reversed ... As one reviewer commented, "poor machine quality"', I think was just that he was trying to fit the wrong pieces together due to mislabeling. Someone needs to proofread the parts and pictures instructions. The online assembly instruction page is incomplete in that it shows only one page, the problem is on page 2-3. I had, in frustration, thrown out the instructions otherwise I would upload them (as a photo) with what should be the correct matching of pieces. It's a simple fix to add an addendum to the instructions and they haven't, either because they aren't aware of it, or don't care and think the customer will eventually figure it out. The concept is good - the craftsmanship (metal work) was very rough. Trying to thread the bolts, nuts etc was challenging as the metal was very roughly cut. This is the perfect kayak rack for me. 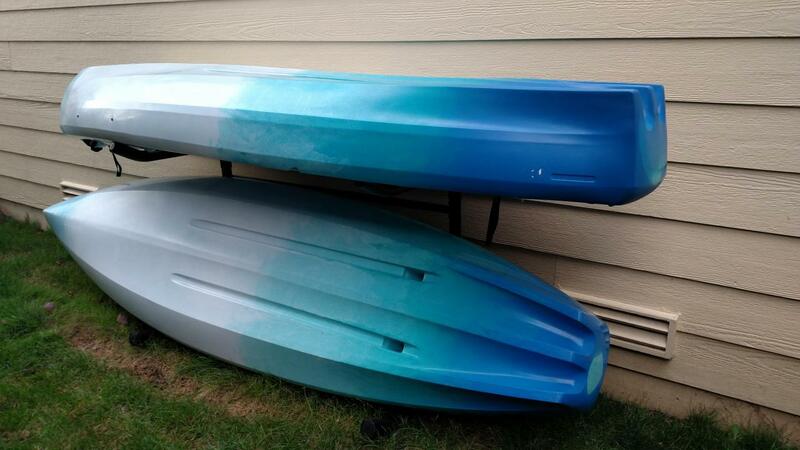 I have 2 - 10' recreational kayaks (LL Bean and Wilderness Systems). I use this rack outside under my elevated deck. It fits the 2 kayaks in a really compact space and I am able to store both of them with the bottom side facing up so I am not worried about them collecting water that drips down through the deck. The rack seems very strong and have nice padding on each of the rungs (we will see how long this lasts outdoors). Before this rack I kind of just laid the kayaks anywhere I could find and I would always have to move them because they were in the way. Now they are both tucked away. Very happy with this product.